I did draw on Monday as I promised myself, though not as intensively as I do when I’m face to face with a model and surrounded by other artists hard at work. At home, there are the siren temptations of the kitchen (I’ve been drawing for ten minutes! I deserve a pot of chai!) and Perry v. Schwarzenegger (no, I can’t just listen to the radio and draw–I have to leap up and argue with the attorneys!). And this model does not sit still very long, so it was largely an exercise in 10-second gesture drawings. 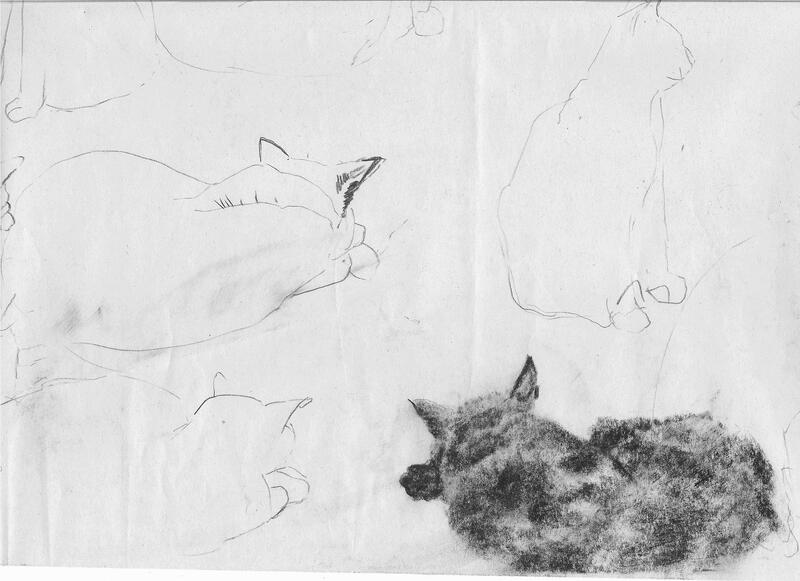 However, she finally slept in one position long enough for me to draw the one on the bottom right. Using the broad edge of a charcoal stick instead of a pencil was the key to showing fur in a way I’ve never managed before. Joy really likes this, so I’m going to dig out the fixative and give it to her for her office. « Happiness is . . .